Hey everyone, we need a little help to test a new optimization/smoothness feature in Steam experimental. What we've done is made it so that the game can run with a variable time step for physics. This should mean that slower machines get a small FPS boost, and more powerful machines get a smoother experience. So it's potentially a win/win... faster and smoother. However, this isnt normally done in games like this, so we're going to need some feedback if strange things start to happen. For instance, potentially have unstable physics, objects falling through the floor, or the behavior being frame rate dependent. In our initial testing we didn't experience any of these problems, but it's a big game and the experience may be different on machines with different performance. (you may need to use F8 to allow clicking the button). Thanks everyone for reading, and testing this out. We look forward to your feedback, good and bad. Not leaving the spoiler safezone though! I really hope this works. Be nice to see everybody being able to play the game. And a whole lot less moanin' & groanin' in the forums. So far, while racing around at full throttle in the Seamoth, all I've seen that's weird is that creatures pop up before big scenery doodads. As such they tend to ignore the scenery collisions until they are rendered, causing some hilarious spinning around of the creatures. They quite literally freak out and sometimes end up inside the scenery only to pop out after the freakout spinning thing they do. Troops, take to the water! We have some frames to hunt down! Just went tearing in and around and through the NW Mushroom Forest in the Seamoth and had no issues with limbs spawning and the resulting collisions that have plagued this area! Funny enough, I had *just* switched to Experimental mode (like literally 10 minutes ago) due to severe graphics issues from the latest Stable update. The terrain loaded up in smaller chunks, which meant popup anytime I travelled for longer than 10 seconds at a time... This has happened in the past, but it's far more noticeable now. What's worse is that certain objects show up from a distance no matter how far away you are... whether its seabase elements or the twisted undercarriage of the Aurora... holy cow, it looked bad to see that unfiltered from 700 meters away. But the Experimental mode fixed those issues now, and the game is running MUCH much better now... I'll look forward to testing out the game and seeing how much more gumption it has now! So far there is some really good improvements! I can go from running bare minimum settings to medium ish settings. Only issue is at one point the entire ground disappears when I change the settings, and maybe in some other instances, but later fixes itself, possibly only temporarily. Also does Anti-Aliasing and Vsync cause lag, or improve lag by any chance?? Should I keep them disabled, enabled, or what? Audio sometimes plays like 20 seconds after the caption shows up (might not be related). So I don't know if it's been mentioned elsewhere before now, but as of today's Experimental update for 9/25 a lot of the core Seabase component recipes have been changed. And I know it's nothing terribly surprising, as Experimental always features new stuff, but these are changes to stuff that have not really been changed in over the last 18+ months. There are likely other changes, but these were the ones that threw me off the most. I realized something happened as while exploring with my Cyclops last night, I carry materials for a Moonpool and two Thermal Plants for mobile power recovery. I built them last night with the normal stuff, but upon deconstructing them to move along I got back all of these weird items I didn't have before. I do like that some of these rather underused items are being put to use, such as Silver (once again) being in higher demand, as well as Lead being more than a one-off for the Radiation Suit. But one thing that bothers me is how some of the recipes are distributed. Take for instance, the Moonpool: I am somewhat glad that it needs fewer mats (5 vs 9) but reducing the construction without displacing the mass just seems weird to me... The Moonpool needing "40" Titanium Ore before (4 Ingots) whereas the Foundation just needs 6, made sense what with it being a larger and taller room, instead of the flat part of the Foundation... cutting it in half just feels weird (not to mention that 1/4 of the Lubricant also feels off). The entry is truncated to save space, but the basic info is there along with highlighted info: Why does an Observatory only need two Stalker Teeth to be made and not any more than that? Why does it need just three quartz, when that alone is just 1 1/2 of a sample of a single Glass? The Observatory should require far more Glass than what is actually used to make it. Then there's the second half of Bart's log entry: He mentions a pack of teeth - while the exact amount is not specified, he likely needed many of them to make his Observatory. Why then doesn't the recipe call for actual Enameled Glass? It should really need four Enameled Glass for its construction. Bart clearly notes that standard Glass will not work; it must have the protection from Enameled Glass to be able to be structurally sound. So, I guess my beef with the recipes is that a lot of them just don't make sense. I'm glad to see the developers willing to change stuff around, but there really should be more common sense in regards of construction. Maybe the Moonpool should use less mass, but the Observatory AND the Water Filtration Machine (Just Titanium x2 for a machine that large? And no Coral for filtering water, no Pipes for distributing water, and no Wiring Kit/Computer Chip for you know, the complex circuitry that powers it all?? ) really should have their recipes examined before launch. EDIT: It looks like the WFM recipe was changed after all! It's now Titanium x3, Copper Wire, Aerogel... it's not quite the change I envisioned, but I am happy to see the WFM now is more than just a steel drum! Ooof...that's a major shift. Early-game progress just got a lot tougher with the addition of Silver to the solar panel ingredients. And adding aerogel to thermal plants relegates it to late-middle game. I'm sure there's a reason, and after a while you can get used to most things, but I can't say I'm entirely a fan of the change. Solar panels require silver. Great, so basically all power sources are now harder to do. I hate this change. But at least Foundations won't bleed all your titanium. I wanted to try to make a solar farm reach the PCF. Transmitters are hell to make now. 1. After the power rebalance, I'm finding I need to build a lot less solar panels. So, adding silver to the solar panel recipe may not be as bad as it sounds. My first reaction upon hearing of the change was, "The game is dead! I'm uninstalling it! This is terrible!" But upon further thought... It might not be as bad as it sounds. Silver and copper are still random to people. My friend yesterday took 3 hours to find silver. Every stupid drop was giving gold and titanium. I hope you're right. Seriously - these discussion are off-topic! The question is: Do you see physics glitches with the option on? I've noticed a few creatures clipping into the ground and then bouncing up - but that used to happen in the old version - so it is hard to say if it is worse. We've now changed this to be default on, as the FPS benefits outweighed the very minor issues we've seen. Please continue to post issues to do with Physics. 1. 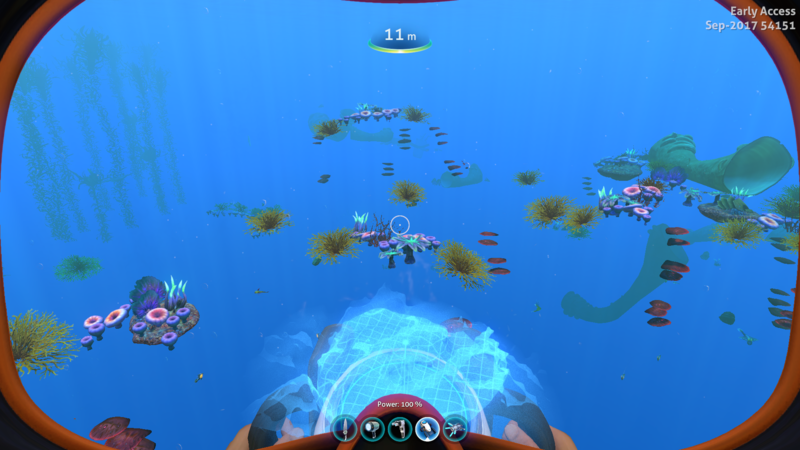 Creatures now react randomly when they load into the world: Sometimes I see fish like Jelly Rays or Reefbacks swimming sideways or even backwards. This is not new, but it happens far more frequently now. 2. Sections of the terrain disappear for a second, or even flash in and out of existence: This also has happened in the past, but again it happens much more frequently than I am comfortable with. 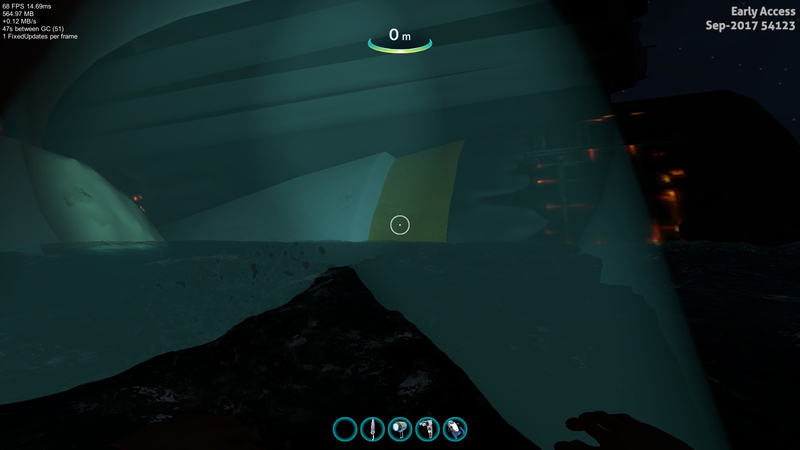 Sometimes you can even swim through a temporary hole in the terrain and clip deep below than what would be allowed. 3. Blueprint recipes have drastically changed: No, it's not a physics/modelling issue. But since an 18+ month gaming aspect was suddenly changed without warning, I consider it to be distressing. 4. 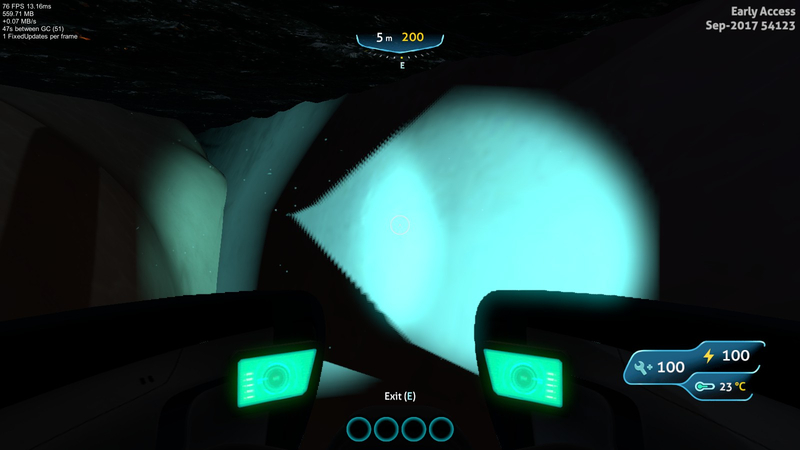 Elements in the ocean clip through the Cyclops: For whatever reason, the Cyclops is no longer solid anymore and allows stuff to phase into the vehicle. It's a minor annoyance when Creepvines appear inside, but it's far more frustrating when Lava Larva/Lava Lizards appear in the vehicle and cannot be removed. And as per the above #4 issue I would also like to ask: Lava Larva like to 'suckle' energy from the Exosuit and Cyclops. But the environment they're in, there is lava and magma creating more thermal energy around these vehicles. So why do they keep beelining for them when logically it should be less appealing? 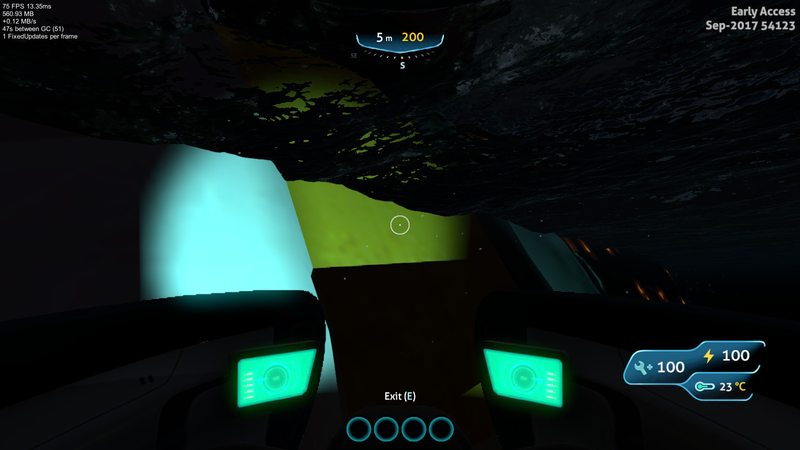 Furthermore, I have taken others' ideas to "power down" the Cyclops by removing all Power Cells when I'm away from the vehicle. WHY THE HECK do Lava Larva cluster around an energy-deprived vehicle, bopping their ugly heads against it constantly, just waiting to latch on the mere instant I try to pilot it away? (Not to mention that removing all power disables the Pilot Sub command, warranting a save/reload just to get access). I get that Lava Larva are a nuisance and an obstacle to overcome in the ILZ/ALZ. But between constantly babying the Cyclops, trying to avoid the Sea Dragon attacking it, having to recharge Power Cells via a Moonpool and a Cyclops with Thermal Reactors, AND having the Cyclops Shield drain power tremendously while it does NOT remove/kill Larva when the Shield is turned on? I'm really, really straining to keep playing at this point, as my threshold of frustration is exceeding any fun I am having at this point. So, yeah... this is my gameplay experience up to this point after trying the new Experimental Performance Option that Obraxis asked us to try out. I'm pleased with how smooth the game is running, irritated by weird graphics/physics issues, and perplexed/frustrated by how the gameplay is up to this point. Using 2 Grav spheres to babysit your Cyclops. Now this option is default, I'm closing this thread. Thanks everyone!